At various stages, affected groups realized the extent of what had been planned for Celendin. Teachers, students, workers in the municipality, left-leaning political groups, and the Rondas Campesinas (7) united to form a platform of civil society organizations (known as the Plataforma Interinstitucional Celendina) from which they would organize a campaign against the project. Resistance also formed in Bambamarca/Hualgayoc – a province affected by 200 years of mining and whose only remaining source of uncontaminated water is threatened by Minas Conga. The region of Cajamarca, in the northern highlands of Peru, is no stranger to foreign invaders exploiting their natural resources. In the year 1533 when the Spanish conqueror Francisco Pizarro captured Atahualpa – the last Inca, his people surrendered a room full of gold and two of silver in the hope of securing his release. Pizarro received the treasure, but executed the Inca regardless. Five hundred years later the invaders are back and demanding their gold and silver, and much more besides. The financial crises that swept Latin America in the late 1980s-early 1990s left many economies in ruin. International financial institutions, led by the International Monetary Fund (IMF), fell over themselves to lend money to the flailing governments. Peru, under the leadership of the authoritarian Alberto Fujimori, eagerly accepted. As is the custom with IMF agreements, the money came with a stack of economic conditions–conditions which included deregulation, privatization, and opening domestic industries to transnational corporations. In Cajamarca, one of the first corporations to arrive on the doorstep was the mega mining company Yanacocha – majority owned by US-based Newmont Mining Corporation and part owned by Peruvian Buenaventura (a company owned by one of the richest families in Peru), with 5 percent financing by the IFC of the World Bank. Yanacocha is actually a native Quechua word meaning ‘Black Lagoon’ – and was a lagoon until Yanacocha (the company) set its sights on it – now it’s an open pit so huge it can be seen from space. Yanacocha’s replacement for this lagoon that gave water freely to the surrounding communities was an artificial reservoir, a tactic they repeated for other lagoons they would come to destroy. These reservoirs are now dry – serving no-one, and the mainly agricultural communities below now experience severe water shortage. What water does flow from descending rivers is contaminated; the source of the Rio Grande, one of the largest rivers feeding Cajamarca, is now three huge tubes spewing waste water from the mine. As a result of this contamination, local farmers have reported high levels of animal deformities and death; there are numerous instances of trout deaths in the tens of thousands because of the presence of heavy metals, arsenic, and high levels of acidity in the water. (1) The population in general have reported unusually high rates of cancer, skin diseases, and birth deformities. Yanacocha itself admits its appalling record, “We are not proud of the current state of our relationship with the people of Cajamarca.” This admission came after a ‘Listening Study’ commissioned by Yanacocha, and showed the dismal state of public opinion about the company who, the study states, “suffers from an inability to listen effectively to the community.”(4) However, the company continues to press ahead with wringing the earth dry despite an obvious lack of social license. Having extended into various satellites, and exhausting them, Yanacocha had planned to move swiftly into the neighbouring province of Celendin to execute a project that would dwarf all that it had done before – Minas Conga. The Minas Conga project, projected to be three times the size of Yanacocha and the largest mega mining project Peru has ever seen, plans to consume 3,069 hectares of land. It would drain and exploit two mountain lakes to extract the gold and copper that lies beneath. The material extracted would be dumped on top of two other lakes – effectively beheading a complex hydrological system and the source of five rivers. Whatever water sources that would remain would most likely be polluted with heavy metals – as they plan to produce an average of 90,000 tons of toxic waste tailings per day, every day for 17 years. These astounding figures come directly from Yanacocha’s own Environmental Impact Assessment (EIA), which, as shocking a read as it is, is widely criticized by academics, lawyers, civil society, and the local communities for not telling the whole story. World renowned hydrogeologist expert Robert Moran describes how the EIA fails to examine the complex subterranean water system which connects the mountain lakes to the wetlands and rivers. (5) Due to the severe lack of essential information needed to understand the real effect of the extraction activities, Moran calls it “basically a public relations document, intended to promote the acquisition of permits.” Another report heavily criticizing the EIA came from the government itself – lead by Jorge de Chave, then Vice Minister of Environmental Management, who soon resigned after the government refused to release it. Despite these deficiencies and criticisms the EIA was approved. This not surprising however considering who passed it; unlike other countries where the Ministry of Environment is responsible for approving EIAs, in Peru it is the Ministry of Energy and Mining who approves its own projects, a fact considered by some to be unconstitutional. (6) Furthermore, the engineer who was responsible for the writing of the EIA, Felipe Ramirez del Pino, while working for Yanaococha, then entered the Ministry of Energy and Mines to approve his own work. This is typical of the revolving door between mining companies and the government in Peru. Additionally, the presentation of the EIA, the only change for the affected communities to have their say, served no such function. The ‘audience’ took place in La Encañada, in the province of Cajamarca, despite the fact that 80 percent of the effects of Minas Conga would be felt in the province of Celendin. The vast majority of Celendin citizens, including those living nearest to the proposed Conga site, were not even informed about the existence of the EIA, never mind an event to present its contents. Yanacocha claims that 31 out of 32 affected communities were consulted; campaigners claim the actual number of communities affected would be 200 – and most of them were not consulted. At various stages, affected groups realized the extent of what had been planned for Celendin. Teachers, students, workers in the municipality, left-leaning political groups, and the Rondas Campesinas (7) united to form a platform of civil society organizations (known as the Plataforma Interinstitucional Celendina) from which they would organize a campaign against the project. Resistance also formed in Bambamarca/Hualgayoc – a province affected by 200 years of mining and whose only remaining source of uncontaminated water is threatened by Minas Conga. On November 24, 2011 the campaign was officially launched with a mass mobilization at the mountain lakes where all groups involved pledged to protect their water source. 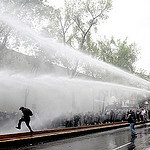 However, this day also marked the beginning of the repression of the protesters. The national government, desperate for a project that would generate $300 million from taxes, royalties and fees to move forward (8), sent in the national police to suppress the gathered masses. They fired live ammunition into the crowds leaving 19 protesters injured. One man was left paralyzed, another lost part of his leg, and another his sight. As the protests continued over the next year so did the police aggression. On July 3 and 4, 2012 five protesters were shot dead by the state security forces. One of the deceased, Cesar Medina Aguilar, a 16-year-old boy and local youth leader, died from a direct shot to the head. The other four men died from shots to the head, throat and chest, while some shots were fired from army helicopters. To enshrine this state of war that the government had declared on its people, it enforced a state of emergency – suspending civil liberties and subjecting the three provinces of Celendin, Cajamarca and Hualgayoc to intense militarization for a total of 8 months. Leading human rights organizations such as Human Rights Watch, Amnesty International, the Inter-American Commission on Human Rights (IACHR) and the National Coordinator of Human Rights in Peru (CNDDHH) have all made statements on numerous occasions calling for an end to the excessive use of force by the state during the protests and have called for investigations into the deaths, injuries and allegations of torture of protesters. To date no such investigation has taken place. One family who lives on land Yanacocha wants, but who have refused to sell it to them, have faced two years of violent intimidation. On two occasions the company entered the Chaupe family’s land with over a hundred heavily armed police in riot gear. They beat the mother and daughter unconscious, killed numerous animals, destroyed their house, and put their son in hospital for 3 months. (10) When the violence didn’t work the mining company brought the family to court claiming the land was theirs. Without even looking at the document from the family demonstrating their rightful ownership the judge ruled in favour of Yanacocha – ordering the family off their land with a suspended jail sentence and damages to pay to the mining company. Due to a huge national and international outcry, and with the help of the local NGO GRUFIDES, this initial ruling was annulled on appeal. However Yanacocha plans to continue with this attack and so the investigation process will begin anew. 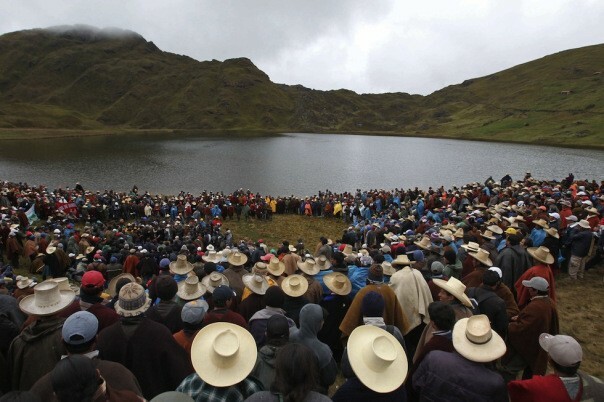 Yanacocha uses the argument that they will build reservoirs to replace the four mountain lakes they plan to destroy. They claim that the water in the lakes is unfit for human consumption and that they only provide water to the communities during the rainy season. Their reservoirs, they claim, will increase water supply to the communities all year round and the water will be artificially treated. With regards to water supply, it is true that the area already has water shortage at certain times of the year – it is an area vulnerable to climate change, and has seen more dry periods in recent years. However, the answer is not to tear up the head of the water basin to destroy the remaining water supply. What is needed is more investment in agriculture and ways to mitigate the effects of the change. This has resulted in an avalanche of mining concessions – 69.95 percent of the province of Cajamarca and 58.80 percent of Celendín is under concession to mining companies. Neighbouring Hualgayoc is 91 percent concessioned (13). Yanacocha has almost finished exploiting its primary and satellite projects, and after Minas Conga it has three other projects in the region at the exploration stage. A Chinese company, Lumina Copper SAC – part-owned by the Chinese government – is waiting to realize its 2,500 million copper project Galeno. 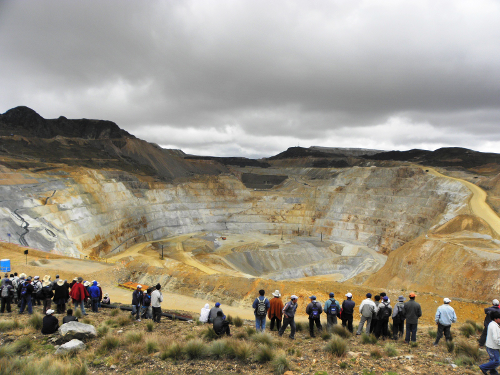 British Anglo American are at the exploration stage of their Michiquillay project, La Granja project belongs to British/Australian Rio Tinto, and Canadian Sulliden Mining Corporation is hoping to progress with its copper and gold Shahuindo project. There are several other smaller projects also at the exploration stage. (14) If all of these projects were realized Cajamarca would effectively be transformed into one of the largest mining districts in the world. Apart from huge amounts of water and land, what these mega projects need is energy. Eva Arias, president of the National Mining Society in Peru (SNMPE) has stated that Peru needs to increase its energy supply by 40 percent if it is to meet its mining needs. (15) To serve this demand, in June 2010, three months before leaving office, Peruvian president Alan Garcia signed the Peru-Brazil hydropower agreement with then-Brazilian president Inácio Lula da Silva. This laid the grounds for 20 mega hydroelectric projects to be realized along the Rio Marañon – one of the main rivers flowing into the Amazon. For Brazil, this meant construction contracts for the building of these projects, and the promise that a large portion of this energy would go to meet this emerging power’s own energy demands. The Peruvian government didn’t have the money to invest in these projects, so Brazil offered loans to its poorer neighbor through the Brazilian Development Bank. So a good deal for Brazil, and also a way to ease the energy worries of the mega mining sector as what is not sold to Brazil would be sold to the high-consuming mining projects. For Celendin, to complement the would-be mega mining district dominated by Yanacocha, the Brazilian company Odebrecht has the rights to build the hydroelectric project Chadin II (Odebrecht coincidently has also been awarded the construction contract for the first stage of the Conga mining project – a contract worth more than 500 million dollars). Chadin II would affect over 1000 people living along the river valley; many would be displaced due to flooding, others would lose their livelihood as the river level rise would significantly alter the micro-climate of the area, making current forms of agriculture unsustainable. Engineers and environmental experts have also documented the rich biodiversity that exists in the region – many species are unique to the area, some are endangered – all of which will be negatively affected by the realization of this project. Once again, this is the first in a long line of mega hydroelectric projects waiting to be realized. This capitalist dream of a mega mining district with energy on tap has been interrupted by desire of the local population to protect their livelihoods and their lives. Adding to that though, further obstacles have actually come from the capitalist system itself. Due to the economic crisis that shook the western world in 2008 people are now consuming less – either from a lack of buying power or from a deliberate effort to extract their power from the unrepentant machine that wreaked havoc on their lives. With people buying less the factory of the consumerist world – China, is finally showing signs of slowing. From 1978 until 2011 the Chinese economy had maintained a rapid annual growth rate of 9.5 percent on average. Last year its GDP grew by only 7.8 percent, the slowest pace in 13 years. As many of the European countries remain in recession it is likely that Chinese growth will continue to slow. A direct result of this is that the Chinese industry does not need as much raw materials. China is the main buyer of Peruvian copper – counting for 41.5 percent of its sales, therefore a drop in Chinese demand means a drop in Peruvian sales. (16) Gold sales have also dropped as a large percentage of the gold extracted ends up as jewelry in Western shop windows – the sale of which has taken a hit in the recession. As a consequence of this falling demand, the price of metals on the international market has also fallen. In the last 6 months the price of gold fell by 29 percent, copper by 40 percent. All of this means that the extractors are not getting as much for their spoils and are struggling to keep their investors happy. However what the elite is hoping for is for the people in the traditionally rich West to forget the day when the system’s belt broke and left it exposed. They’re hoping the years of indoctrination – propaganda permeating feelings of inadequacy and the need to fill the hole with things, will win over the desire for change – and that the people will return to borrowing more and spending more to fuel the earth-destroying machine. Meanwhile, in Cajamarca, Yanacocha is eagerly awaiting this recovery of consumption. They’re not waiting idle however – they’re building their roads and reservoirs, and they’re doing their best to break the resistance through misinformation and repression. Roque Benavides, owner of Buenaventura and one of the main stakeholders in Yanacocha, recently stated ‘Neither Newmont nor Buenaventura are disposed to losing money’ (17), but neither are the people of Cajamarca disposed to losing their water. So they will keep on resisting, and fighting for their right to determine their own future. 1. Impacts of Minera Yanacocha`s activities on water resoureces and the affirmation of citizen rights. The Quilish Crisis 2004. P Marco Arana Zegarra, GRUFIDES, 2004. 2. Choropampa: the Price of Gold. Documentary from Guarango productions. Written and directed by Ernesto Cabellos & Stephanie Boyd. 3. Open Pit Documentary. Written and directed by Gianni Converso and Daniel Santana. 4. “Listening to the City of Cajamarca” by Centre for Social Responsibility in Mining (CSRM) of the University of Queensland, Australia, and CCPM Grupo Consultor. 5- The Conga Mine, Peru: Comments on the Environmental Impact Assessment (EIA) and Related Issues. Robert E. Moran, Ph.D.
7. Rondas Campesinas: autonomous peasant patrols in rural Peru, originally formed as a protection force against theft who now have enshrined in Peruvian law their right to administer justice in their communities.